In 1945, at 14 years of age, young Alice went to meet her school friend Violet Walters, who, at 15, worked at a little grocery store at the bottom of Bread and Cheese Hill. The older girl confirmed they’d go to the youth club after she finished work, when her boss called to her – a customer had left or forgotten her bacon rashers on the counter. As Violet hurried across the road to catch up with the forgetful lady a small grey van came hurtling down the hill and drove straight into her. Violet was thrown into the air, but the vehicle carried on to the next road junction, Gifford Road, where her body rolled off the bonnet. She died instantly. In deep shock her friend Alice crossed over the road, got on a bus and returned to Hadleigh, where she sat in the bus shelter by the church until at least seven o’clock that evening. Her parents and others were out searching for her everywhere until Johnny Harvey found her still hiding in the shelter and walked her home. 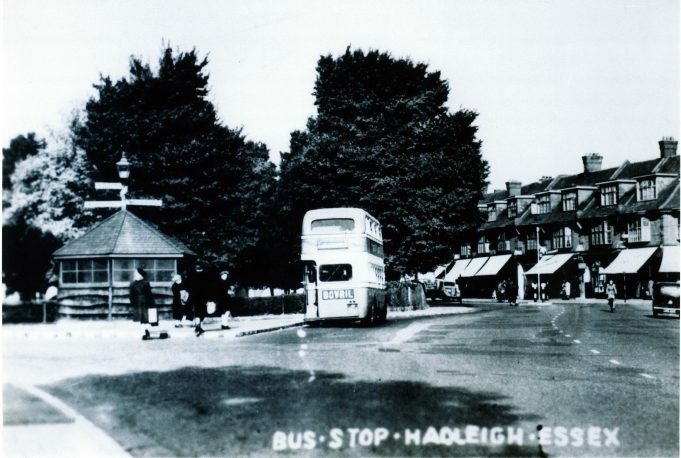 Hadleigh Bus Stop by the Church, where young Alice hid after her devastating experience. I am pleased to say I knew Alice Chafer, she was our neighbour in Parkfields, Thundersley. Her husband, Harry, was a fireman and features in other articles on this website.